The strategy proposed to achieve the main goals of the project is based on the completion of 6 Work Packages (WP), four basic WPs to develop the STIFFCRANK concept, one WP focused on demonstration and dissemination of results and a WP for Project management. WP1 - Reference residual stress profiles as benchmark for fatigue strength improvements. WP1 The stress level induced at the fillet of crankshaft sections during fatigue tests will be calculated by finite element simulation to construct the stress versus the number of cycles curves. This information will be related to the residual stress profile measured in reference crankshaft sections, produced by means of standard surface hardening techniques. WP2 - Optimizing residual stress profiles and screening of laser surface conditions. WP2 The link between the metallurgy along the hardened and non-hardened region with dependence on the heat input/cooling rate and the residual stress profile will be systematically investigated. 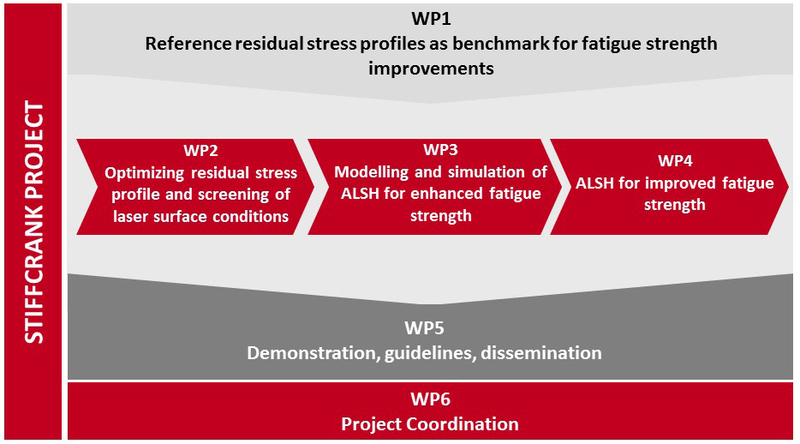 WP3 - Modelling and simulation of ALSH for enhanced fatigue strength. WP3 A three-dimensional transient finite element analysis will be developed to effectively simulate the process of laser surface hardening, by combining comprehensive thermal-mechanical and mechanical-fatigue modelling that will be validated against the experimental tests. WP4 - Advanced laser surface hardening (ALSH) for improved fatigue strength. WP4 Different approaches for ALSH aimed at optimizing the thermal cycle will be pursued and compared, based on the results of WP2 and WP3. WP5 - Demonstration, Guidelines and Dissemination of Results. WP5 Involves the development of the different demonstration activities, dissemination, training and knowledge management activities that will be identified and integrated into a Plan for Dissemination and Exploitation of the Project’s Results. WP6 involves the coordination activities (overall project management, legal, financial, commercial and policy issues) and to manage the technical (time, resource, competence and budget risks) and strategies tasks.